The perfect 3-in-1 gift. 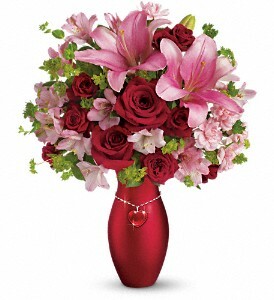 She'll love the romantic bouquet, cherish the chic vase, and wear the dazzling glass heart pendant for years to come. An enchanting three-in-one gift that will win her heart over and over again. Red roses, red spray roses, pink Asiatic lilies, light pink alstroemeria, pink carnations and bupleurum accented with assorted greenery arrive in a lustrous red ceramic vase with a stunning glass heart pendant necklace. 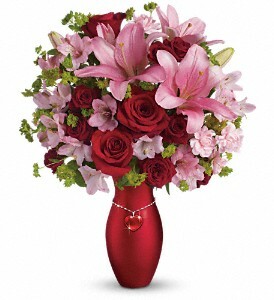 Perfect 3-in-1 gift: Includes bouquet, vase and dazzling glass heart pendant necklace! This gorgeous red ceramic vase and glass heart pendant necklace are from Teleflora's celebrated Flowers-in-a-Gift collection. She'll love them both for years to come.